Truck bed camping can be a blast; indeed, I think it is one of the best ways to travel and get out there, but you have to do it the right way. Desk to Dirtbag has become the #1 site and resource about the whole truck bed camping movement and I have received thousands of emails over the years from readers asking for help and been tuned in to thousands of conversations in our Pickup Truck Camping group on Facebook. That’s all to say that I’ve seen virtually all the truck bed camping mistakes or fails that people make. Heck, I’ve certainly even experienced a few of them myself over hundreds of nights and 10’s of thousands of miles. 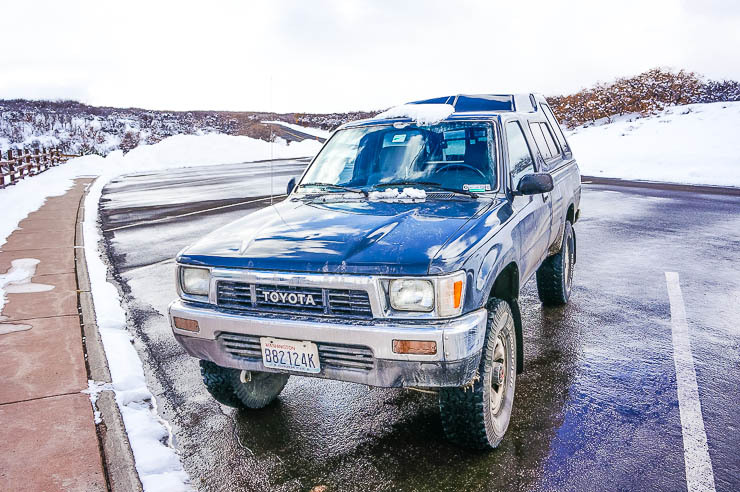 Not only have I embarked upon a great American road trip more than a few times, but I’ve also driven across all of Latin America with my ol’ truck. Needless to say, I’m very aware of the pros and cons of truck bed camping. 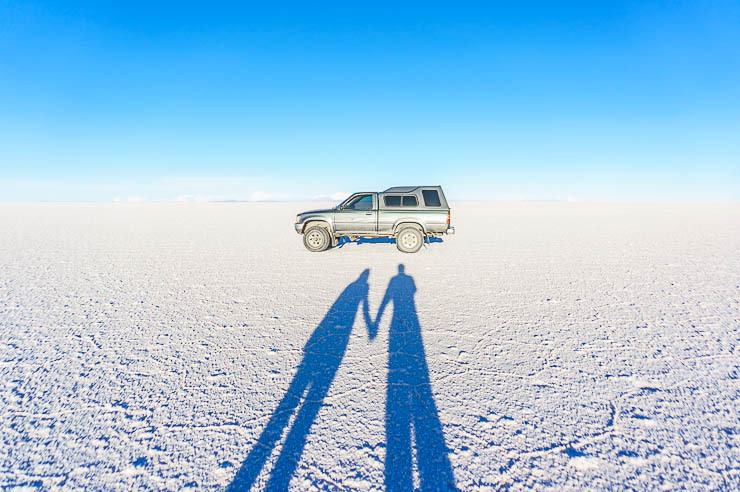 So, let’s get on with it, these are a few of the biggest truck bed camping fails that you should try to avoid, and which might completely ruin your trip. Part of truck bed camping is building out the back of your truck below the canopy into a cool and cozy space where you can have your own little home on wheels basically. This means gear storage, sleeping, a place for cooking (with ventilation, of course), and a number of other factors. I did a LOT of research about truck bed camping before I built out the back, and I’ve seen the pretty photos of those super complex builds with the super fancy roll out drawers, custom lighting, carpeted storage bins, and so much more. The more you over engineer your truck bed camping setup, the heavier you are making your truck which will eat into your fuel economy for every mile your drive. The more complex the setup, the more “permanent” these installations usually are, which means less flexibility as your needs change, and increased hassle if you need to remove the setup to use your truck like normal. My setup, for example, takes less than 10 minutes to either completely remove or completely install. My setup may not be the most Instagram-worthy, but it is definitely one of the most adventure-worthy. In an ideal world, you’ll only be in your truck for sleeping and then maybe a few hours in total before bedtime and after waking up. This is why the small space of a truck bed camping setup is something that most people can cope with, even over long periods of time. 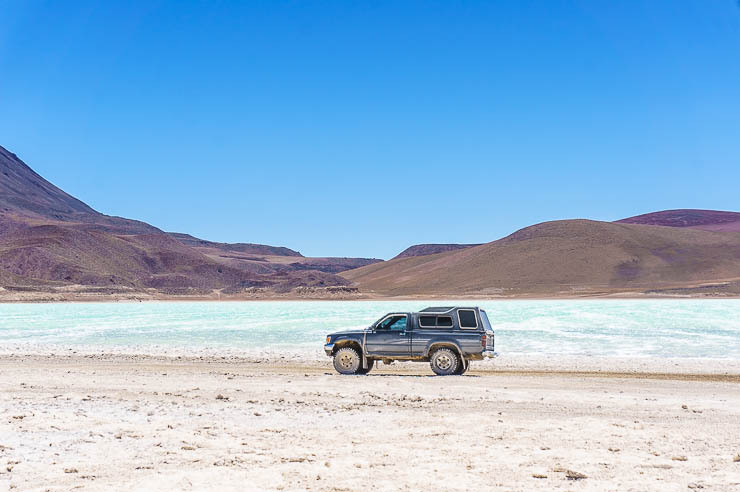 The idea of truck camping has never been just sitting in your truck all the time and hanging out, but rather to use it as a base for all sorts of other amazing adventures. Side Rant: Ever notice how VanLife people post more pictures of their vans rather than the adventures they should be having thanks to their home on wheels? That’s what we don’t want. In the real world, however (especially on longer trips), you are bound to find yourself hunkered down in your truck for longer periods of time, perhaps due to a terribly rainy day or for whatever other reason. The standard truck bed camping approach is to build an elevated platform for gear storage underneath (those fancy sliding drawers and things) but this drastically cuts into your sleeping quarters. Some people end up likening their truck camping setups to coffins on wheels… They are only big enough to shimmy into and sleep, especially if they have a standard canopy rather than the elevated canopy, as I recommend. Imagine being stuck inside your little coffin all day without the ability to even sit up! For that reason, I highly recommend doing the back-shelf approach or the transformer approach that I advocated, rather than the elevated platform approach. Read more about two main approaches to truck bed camping and their pros & cons. There’s nothing like the great outdoors and sleeping under the stars, but the whole idea of truck bed camping is the ability to take shelter. That’s what your truck canopy is for. Throw it on top of your truck bed, and the rest will take care of itself, right? Wrong. You need to take precautions, otherwise, you might wake up one morning feeling very wet. First, make sure your canopy properly fits your truck bed. That should go without saying, but you’d be surprised by some of the rigs you see out there. If your canopy is too small (or too large), or has gaps of light coming through, you need to figure out if it’s defective or unusable for your rig. Don’t ignore this. If air can come through, so can water. Heat will leak out, too. Who wants to be cold and wet on their trip? The easiest quick and dirty test is to jump inside and get a friend to spray the canopy & truck bed points of contact with a hose from all different angles. Also, focus on the tailgate area for this test. It isn’t perfect because a torrential rainstorm will be the real test, but it should help you identify the biggest problem areas. Once you have a canopy in working order, look for ways to ensure moisture never gets in from the outside. Invest in weatherizing truck canopy tape and use it to seal the edges where your canopy meets the bed walls. Pay special attention to the bulkhead, which is the area where the cab meets the bed. Many of my fellow truck campers have issues with water entering through this area, so take the time to waterproof it. Take the time to do this, because having a dry space you can rely on is crucial when the weather is at its worst. Properly sealing your canopy can also help eliminate dust from infiltrating the back which can be a big problem if you’re spending a lot of time off of asphalt. I took the time to use that sticky foam weather sealant to identify these problem areas which dramatically reduced the amount of dust. Do this test at night: with the help of a partner, you can have one person inside and another outside as one of you shines a bright flashlight to identify where light escapes (check with the light both from the outside-in and inside-out). Do you think you’re one of those people that can fall asleep anywhere? That may be true, but that’s no reason to leave a quality night of sleep to chance. A restless night makes it harder to function during the day. It doesn’t make you look tougher if you’re crabby and fumbling around all day because you didn’t sleep well. This was probably my biggest mistake when I first set out… I neglected to have a proper sleep setup because I was an experienced backpacker and mountaineer, accustomed to sleeping on little inflatable sleeping pads and squishing some clothes into a stuff sack for a pillow. This is truck camping, you don’t need to go ultralight (although you shouldn’t go ultra-heavy either). My biggest recommendation is to get a quality truck bed mattress and a nice pillow. You need a pillow you can actually use, not some worn out thing from the back of your closet. And beware of memory foam pillows if you plan to sleep in the cold — those things turn hard as a rock (another lesson learned the hard way… literally). Get some sort of sleeping surface too, so that you don’t lie awake feeling the ridges of your truck bed all night. It could be as simple as a sheet of plywood across the bottom of your truck bed which is basically what I use. Find a sleeping bag that actually keeps you warm and fits your body. None of this needs to be ultra-expensive, but it does need to be functional. For the sleeping bag, at least, it is worth looking to the backpacking world for clues… You want something that is high quality but can still stuff down without taking up a bunch of room. To cover the widest range of temperatures, I think that a 35-degree bag is the sweet spot. It will keep you warm inside your truck camping setup in all but the most frigid conditions… I’ve used mine when outside temps were in the single digits — inside the canopy obviously is warmer, and I also use appropriate winter clothes inside the sleeping bag. When it gets warmer, you can open the sleeping bag up and use it as a comforter. If you’ll be in hot and humid conditions, be sure to just bring along a simple cotton sheet instead. If you can manage to be a little more comfortable at night, it will make the rest of your adventure that much better. Read more about choosing a truck bed mattress and sleep system. You might always think the best of people, but that’s no reason not to protect yourself. On the other hand, it’s no good to spend the time away from your truck worrying about who’s going to steal what’s inside it. So, before your next trip, devise a way to keep your best stuff not just hidden, but inaccessible to anyone but you (and the people you’re traveling with). Sure, you could just trust the lock on your canopy, but what good is that in a smash-and-grab situation? Instead, opt for a storage system that deters thieves with its complexity. You want to make it difficult enough for them to the point where it requires tools for them to get in since almost all of these thefts are crimes of opportunity. If you’ve got the must undercover truck at the trailhead or in the parking lot, the thief is likely to go after the easy mark or the one that screams “I’ve got a bunch of expensive stuff inside” (yeah, again looking at the VanLife people). One reason I love a truck bed camping setup as opposed to many others — even rooftop tents — is just how discrete it is. Most people think it is just a truck with a canopy, not a home on wheels. But canopies are also pretty easy to break into, so I wouldn’t trust hundreds or thousands of dollars of gear to some canopy locks. It is this reason that the gear platform style of truck camping setup is often chosen because one can have a relatively protected area (if there are additional locks) so the bad guys can’t get in easily, even if they smash your window. That’s also part of the reason I made the transformer setup, so I could lock my tailgate to the elevated platform, effectively complicated the life of anyone trying to quickly steal my gear while I’m gone. Hasp locks, in particular, work wonders with this setup when it comes to keeping your belongings protected because you can actually lock your whole tailgate to the elevated platform. Regardless of which type of setup you choose, you should have another locked or protected storage space inside your truck bed camping setup. A great way to completely derail your truck camping adventure is to hunker down for the night in a place you shouldn’t. This takes many forms… You can park too close to the road and leave your truck prone to accidents. You can get too far off the beaten path and get stuck in the mud. You can even plant yourself on someone’s private property and find yourself in trouble with the authorities. There are easy ways around this. Campgrounds, of course, provide the most straightforward answer, of course, then you will have to pay to spend the night… You can expect that to run you $20 or more per night. That’s fine for a weekend adventure, but if you’re going full-time, that would amount to at least $600 per month. That’s why so many truck campers turn to free camping opportunities. 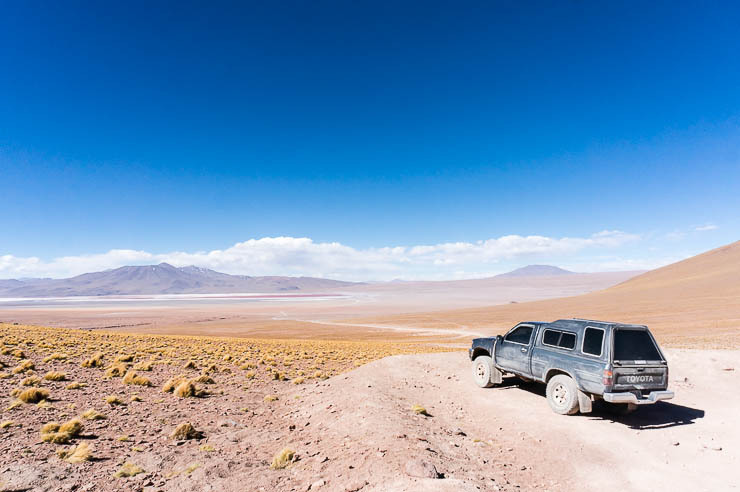 I’ve camped almost everywhere imaginable, from the middle of dry lake beds, Las Vegas casino parking garages, Wal-Marts, gas stations, and every in between… And that’s just in the United States, don’t get me started on the overlanding adventures through all of Latin America. Thanks to the stealthiness of your truck, you’ve got plenty of options that are under the radar too… In urban or suburban areas, you might park in a Wal-Mart parking lot, in the lot of another 24-hour business like a gym or Denny’s restaurant. One of my back up plans is to park at an auto mechanic shops right between some old rigs waiting to be worked on. Pro Tip: Getting a cheap gym membership is also a great way to have access to showers. Make sure to find a good national gym, like 24 Hour Fitness, with lots of different locations if you are planning to be living out of your truck and on the road. Of course, those places aren’t why you’re getting out there, those are just options for “in-between” — the real draw is to find awesome places to camp in mother nature. My go to is the many Federal lands which allow free and unfettered access to vehicle camping opportunities, namely the Forest Service or BLM lands. Pro Tip: If you’re planning a national park road trip then be sure to pick up the America the Beautiful annual pass which will save you tons of money on park entrance fees. My tactic is usually to visit the parks during the daytime and then find nearby free camping. The two best places to find free (or cheap) campsites across the country and beyond are freecampsites.net and iOverlander.com. These are the first places I go when I’m looking for an affordable place to spend the night in my truck. 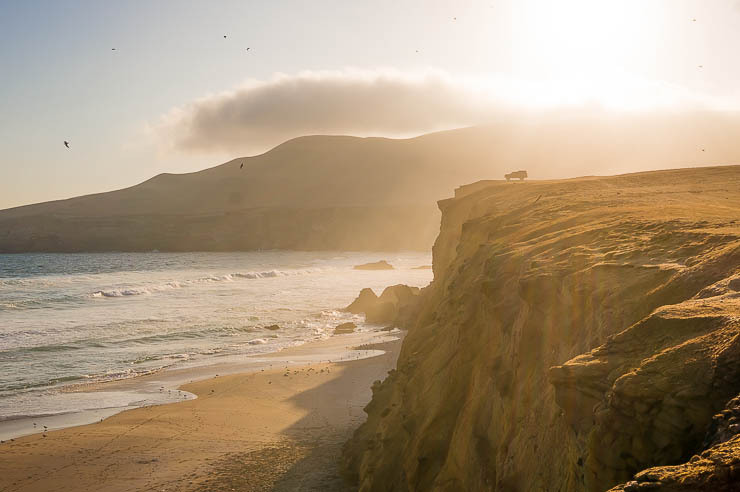 Sometimes the free campsites are actually pretty awesome themselves — maybe not quite National Park caliber, but you’ll usually find some beautiful nature, maybe some hiking trails (certainly nearby), and maybe even a rustic bathroom. Don’t let your taste for adventure cloud your judgment. 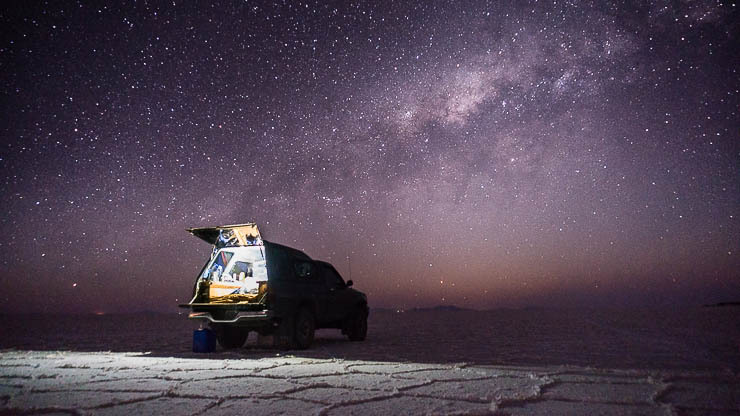 Being in a safe and suitable spot for the night is the key to happy truck camping adventures. Trust me! Electricity is crucial when you’re out on the road, even if it just means keeping your camera, cellphone, and computer charged up and ready to go. One of the most unwise ideas you can have is thinking power issues can be addressed on-the-fly. You need to know how to get power from under your hood to the truck bed. Are you good with just having a cigarette lighter hooked up in the canopy and running on DC? You also need to determine how you’ll maintain power throughout your trip. The needs for someone just charging their cellphone are going to be totally different than someone running a mini fridge back there. At the most basic level, you can charge devices off your main starter battery, but you should monitor it carefully and idle your truck at least once every one to two hours. Do you know how much power you’ll need to use in an average day? 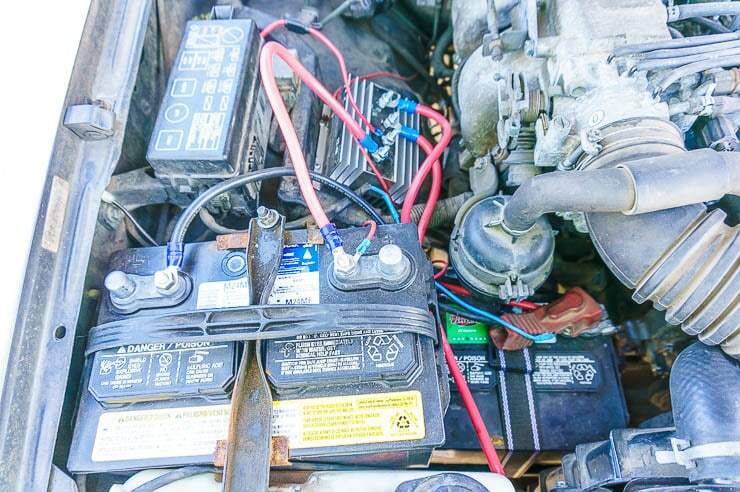 What are you going to do about your car battery? Will you need to hook up a second battery and an isolator? Answer all these questions before hitting the road, otherwise, you’ll stare a major truck camping fail right in the face. I would highly recommend getting a second battery and isolator installed though, as that will bring the worry factor about killing your starter battery and stranding you somewhere to nil. This was a huge upgrade for me and highly recommended. Read more about getting a dual battery setup and isolator. 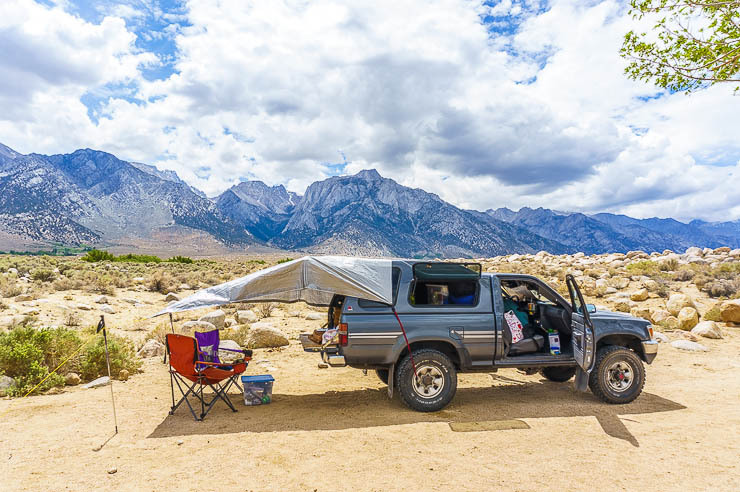 While truck bed camping doesn’t have the weight limits that backpacking or mountaineering entails, it is still important to consider the overall quality of your gear, the amount of space it takes up, and yes, at least consider the weight factor. For one, you will still be camping, so quality gear that will not break, leave you stranded, hungry, cold, miserable, etc., is important. Two, space is still limited in the back so if you buy bulky, cheap gear, you might quickly find that your living quarters have been drastically reduced. High-quality camping gear, especially of the backpacking slant, tend to be much more portable than their cheap counterparts. Three, weight is still a consideration… Overpacking with heavy or bulky gear is going to impact your fuel economy at best, and at worst, it could cause complications for your suspension (especially if you overbuilt the back as discussed above). That’s why it is still important to try and buy the best gear you can and try to ensure that most or many things can be multi-functional. I’ve put together a massive guide about all the gear that I use, so be sure to check out my recommended truck camping gear and accessories. Don’t neglect fundamentals of your truck either… That means a high-quality canopy (I use the Leer 122, but any elevated topper will do) and even nice tires that offer high clearance (I use the BF Goodrich T/A KO2s and love ’em). Read more about my favorite truck camping accessories and the best gear. These eight truck bed camping mistakes are certainly avoidable. It just takes a little forethought and common sense, really. 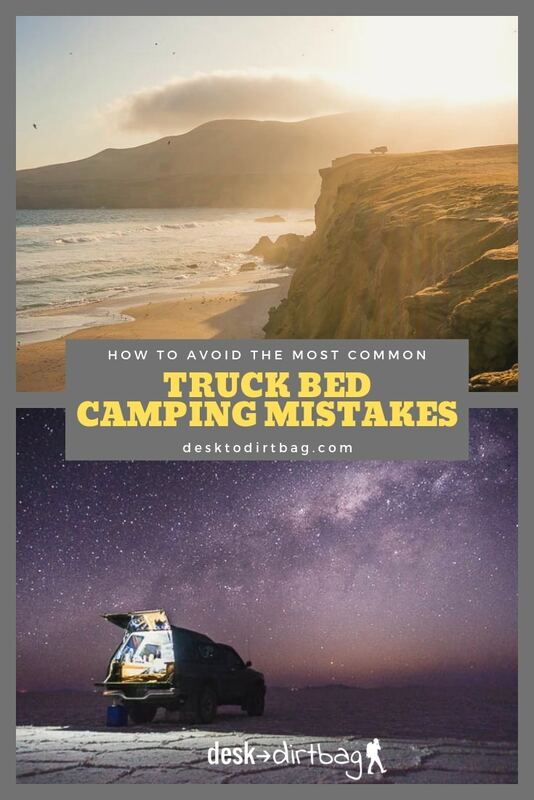 Plus, you’ve got the advantage of learning from my mistakes or the mistakes that I’ve seen others making in my years of truck bed camping experience. Honestly, truck bed camping is one of the best and most affordable ways to get out there, travel more, and find more adventure, so it’s something that I recommend to almost anyone (who will listen to me). Did you enjoy this post about the biggest truck bed camping mistakes and fails? Take a second to share it on Pinterest, Facebook, or Twitter. Thanks!